Aaron is back! He got another job offer, he must be really headache now! Anyway, we ate this dessert and it was easy and simply good. It's German Vanilla Pudding served with macerated mandarin segments, butterscotch sauce and some leftover toasted pistachio nuts and walnut crumble from my previous attempt on Baklava Ice Cream. This one contains no gelatine nor agar-agar. It is thickened with cornstarch and you pour it into a wet mould. It also unmoulds beautifully. 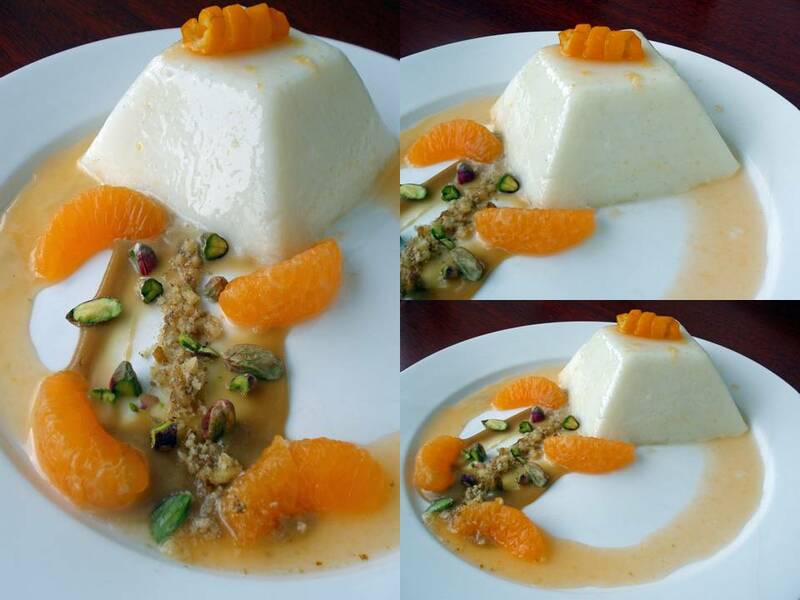 I let a little macerated mandarin syrup dribble down the sides of the mould just like unmoulding Panna Cotta. I also smeared some leftover butterscotch sauce from making sticky date pudding on the plate. All the elements on the plate complimented each other beautifully. You omit the mandarin curls since it is just there purely for decoration. You can eat it but I don't, it's simply too strong to my liking. I adapted this recipe from Mowie of Mowielicious. I didn't have strawberries and let's face it, it is winter here now. Strawberries are long gone from market. I make do with what I have. This is easy and any macerated fruits will pair along beautifully. I make enough to serve just the two of us and cut down the sugar a bit because of the butterscoth sauce. Feel free to add more if you like. Have ready a one cup capacity mould or just 2 ramekins of 1/2 cup capacity each. Make sure it is slightly wet inside. Place it into the fridge while you make the pudding. Place 3 tbsp milk from the 1 cup of milk into a small bowl and whisk in the sugar, cornflour and vanilla paste into a smooth slurry. Pour the remaining milk into a wetted milk pot and gently bring to a boil. Once the milk in the pan starts to bubble, remove from the heat, and whisk in the vanilla paste mixture. It should thicken immediately. Place pan back onto the heat and keep whisking. Allow to bubble for 1 minute then remove from heat and pour into the cold bowl set aside earlier. Allow to cool at room temperature first before refrigerating. Refrigerate for at least 4 hours.You can choose to refrigerate it with a layer of plastic wrap touching the surface but I didn't quite bother. I like it with skin formation for easy removal. While the pudding is cooling, segment the mandarin oranges and add a couple of tablespoons of castor sugar and a splash of Grand Marnier to it. Mix everything around well and let it sit in the fridge until the pudding is ready to serve. Make sure you stir the macerated mandarins once in a while. To serve, place a serving plate over a bowl of pudding and turn it upside down in one quick motion. The pudding should easily slide onto the plate, maintaining it's shape. If it is not coming out, dribble a little macerated mandarin juice on the pudding and let it stand 5 mins before flipping. Serve with the garnishes or any other elements you prefer. I am so happy Aaron is back and a little sweet dessert goes a long way. We had a fun day out today, he accompanied me and we bought some stuffs for myself. He sighed when he saw me bought yet another plate and he asked what's this for this time? It's an awesome looking black plate. Also bought a pair of black leather boots and a large wool quilt to keep me warm through the winter. I am one happy girl now and I wish life would be so good every single day! 15 comments on "German Vanilla Pudding with Mandarins"
you know Quinn...im sincerely n honestly saying.... that one day u shd open a restaurant..u have a way with plating food n you seem to have an innate sense of flavour pairings n you sound just like a chef!! m not just saying htis but i honestly think u have a gift. esp at ur age! I knew nuts at ur age. Quinn, I wish the lives of yours and Aaron's will be as good as ever! Just like the sweet panna cotta!!! I'm so happy for you two! Hi Quinn, this is indeed an interesting recipe. No gelatine and agar agar... must try. Congratulations to Aaron on his job offer... good headache! I may have missed out earlier but have you taken up any job offers? @Shirley: Aaron's got a headache because he has more than one offer to consider. I am still on the lookout and hopefully, will secure one very soon. I have an interview end of this month and I told myself, I must give my very best shot!!!! Thanks for asking though! Your pudding looks so good, just like dining in a restaurant! Very pro!! Quinn, the pudding looks delicious and you are so good at the food presentation, like in a high class restaurant! Hey,good luck! Take time to find something you can feel strongly about! Congrats to Aaron! Love your pudding, sounds really interesting with just the use of cornstarch here. Lovely presentation! Oh, all your desserts are killing me! I'm so lazy at making them but I LOVE to eat them! Lovely presentation too!! Quinn, these desserts look way too good. Looks like something that could have only been ordered in a restaurant. Love the presentation and the slices of mandarins that come with the pudding. Thank you boys and thank you girls! I won't say I am very good in presentation but yeah, I think and plate as I go along. Rather than scatter, I arranged them on with tweezers. Rather than drizzling, I smeared them. Just get creative and plate your dessert! Zurin: I came from a pretty wel-to-do family and over the years I was growing up, I have been spoilt with food and choices and thus have to admit I have a pretty good palate that is picky, hard to please and rather unique. I guess gifted is an overstatement but thanks! Thanks everyone for saying this is restaurant quality but really, all my desserts and cooking are typical daily home whipped food, but I made it fancy because I like my food to look as good as it taste! Thanks for stopping by my blog. I love vanilla pudding.